A three-day hearing in the High Court in London will start on Tuesday 12 April on behalf of 1826 Zambian villagers who are taking legal action against UK based mining giant Vedanta Resources Plc and its Zambian subsidiary Konkola Copper Mines (KCM). The villagers allege that their water sources and farming land were contaminated by the copper mining operations of both companies. They allege they have suffered continual pollution since 2004 and it is still ongoing today, causing them to fall sick and lose their crops. The judge, Mr Justice Coulson, will hear arguments on behalf of the defendants, Vedanta, a UK mining company with an asset base of US$37 billion, and its subsidiary KCM, against the jurisdiction of the English courts to try the claims. Lawyers for the mining companies will argue that the claims should be tried in Zambia because the Claimants are Zambian and the damage occurred in Zambia. The Claimants, subsistence farmers who are among the poorest inhabitants of Zambia, will argue that the claims should be tried by the English courts because UK-based Vedanta should bear equal legal responsibility, given its control over its mining subsidiary and alleged knowledge of the pollution. The Claimants will also argue that there is a very real risk that they will not achieve justice if their claims are not tried in England, illustrated by the fact that they have received no assistance in Zambia during the 12 years they have been allegedly suffering from the pollution. The 1,826 villagers, represented by London based law firm Leigh Day, are members of four artisanal farming communities situated in the Copperbelt region of Zambia along the Mushishima and Kafue Rivers. They live close to the city of Chingola and next to the Nchanga Copper Mine which is operated by Vedanta’s subsidiary KCM. Vedanta bought a controlling share in KCM in 2004. The communities, Shimulala, Kakosa, Hippo Pool and Hellen claim that polluted water is affecting their health and causing illnesses and permanent injuries. Their primary source of water for drinking, washing, bathing and irrigating farms are these waters. The Claimants’ primary source of livelihood is through farming as well as some fishing from the rivers. The alleged pollution has devastated crops and affected fishing greatly impacting the earnings of the local people. Leigh Day issued proceedings on behalf of the villagers against Vedanta and KCM at the High Court in London in July 2015. Lawyers who have been over to Zambia to see the effects of the effluent spills and discharges, claim that the pollution primarily stems from the copper processing part of the plant called the Tailings Leach Plant. Much of the infrastructure was built in the 1970s and is over 40 years old and in need of replacement. Toxic effluent flowing from the Tailings Leach Plant is supposed to be caught by a Pollution Control Dam however the dam is believed to be at capacity and is overflowing directly into the waterways. The effluent is highly toxic containing chemicals such as sulphuric acid and high levels of heavy metals. The pollution emanating from the Nchanga Copper Mine in breach of Zambian regulatory requirements has been widely documented. The Claimants are seeking compensation for their loss and damage to their land and their health suffered as a result of the pollution. They are also seeking remediation of the land and the provision of clean water. The petitioners will win but the money will not come to Zambia. If at all some money does come to the supposed victims, it will be less than 10%. The 90% of the money will go to the mass tort lawyers! Any lawyer worth their salt in Zambia knows what happens with mass torts. It is a small club of ruthless lawyers who hold erring companies to ransom to be paid millions. Just wait and see. 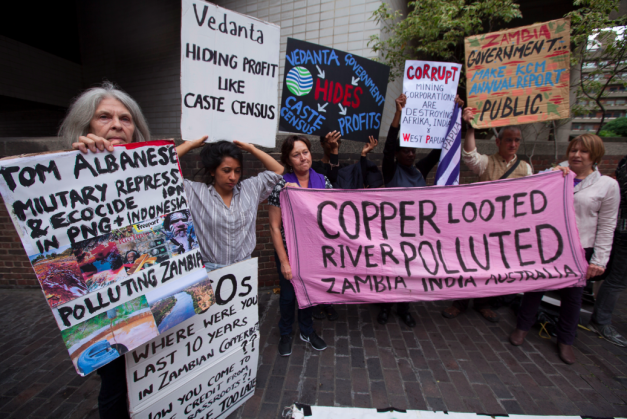 Vedanta will bleed but not to the benefit of poor Zambians who suffered the pollution but rich UK-based lawyers and cronies from elsewhere – not from Zambia, of course. Our lawyers are not exposed to such scams, yet. For hottest news you have to visit web and on internet I found this site as a most excellent web page for latest updates. have done a great activity on this topic! Valuable information. Fortunate me I discovered your website unintentionally, and I am stunned why this accident did not came about in advance! April 2016 | Zambian Eye <Liked it! Best prices. [url=https://wmplati.com/itm/grand-theft-auto-v-gta-5-pc-onlajn-garantija/1847398]Buy GTA 5[/url] – https://wmplati.com Minecraft, Uplay, Steam, Origin. to provide you with a quick heads up! Aside from that, great website! I wonder how much effort you place to create the sort of excellent informative website.